Arizona is home to one of the nation’s most beautiful landscapes known as the Painted Desert. This broad area of colorful badlands stretches over 160 miles and passes through some spectacular landmarks, including Grand Canyon National Park and Wupatki National Monument. And in the middle of this vivid desert lies a hidden treasure showcasing an environment over 200 million years old. 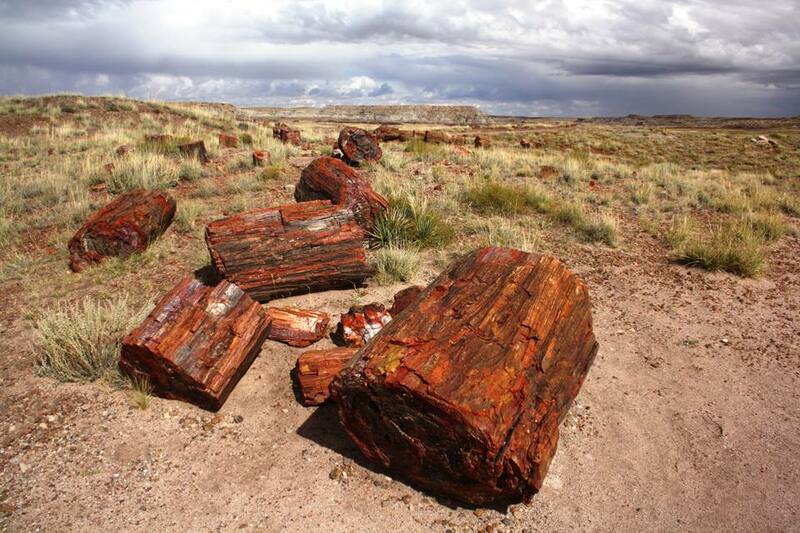 Petrified Forest National Park is living example of our history, revealing the world’s largest concentrations of brilliantly colored petrified wood. To visit is like traveling back in time to a land that remains radically different than the one we know. Over 13,000 years of human history can be found at Petrified Forest. From prehistoric ancestors to the Civilian Conservations Corps, many humans have left their mark in this park. Ancient people may not have understood that the petrified wood around were actually fossilized logs, and instead had their own beliefs. The Navajo believed the trees were the bones of Yietso, a great monster their ancestors slew. The Paiute believed the logs were the arrow shafts of Shinuav, their thunder god. Yet, giant pieces of petrified wood lie scattered revealing a colorful timeline. Visitors can actually get an up close look at the quartz that replaces much of the wood tissue about 200 million years ago. The park is also home to several human artifacts, including hammerstones, blades, and pottery. It is believed that the oldest habitation site may have been occupied just prior to A.D. 500. Taking a tour of the park is like taking a tour of our history; from the petroglyphs of ancestral Puebloan people to Painted Desert Inn built by the Civilian Conservations Corps. This is one national park that can be visited any time of the year. Summer thunderstorms intensify the beauty of landscape while cooler temperatures of the fall attract larger crowds. Winter is also exceptionally beautiful, covering the Painted Desert with sparkling snow. The spring is also a great time to see the desert in bloom, though keep in mind it tends to be quite windy. Driving into the park is your best bet, considering you can also tour Grand Canyon National Park, the iconic Route 66, and other points of interest along I-40. If you travel from Westbound I-40, take exit 311. You can drive 28 miles through the park and then connect to Highway 180. Those traveling from Eastbound I-40 should take exit 285 into Holbrook then take Highway 180 South to the park's south entrance. Another option is taking I-17 North and 4-East, passing through Flagstaff, AZ. The closest airports are in Phoenix, AZ, and Albuquerque, New Mexico. Annual National Park passes may also be used to waive entrance fees, otherwise, both drivers and those on foot will be charged (different) admissions fees. Rainbow Forest Museum: Located within the Rainbow Forest – one of four major concentrations of petrified logs. Old Faithful: The largest fossil log whose diameter is 9.5 feet. Lone Logs: A large concentration of logs, some reaching lengths of 120 feet. Agate House: An eight-room dwelling built by ancestral Puebloans more than 800 years ago. Blue Mesa Trail: Get out of the car and explore this one-mile route through the scenic badlands. Pintado Point: The highest pull-off and overlook of the Painted Desert. Newspaper Rock: Two large boulders covered by more than 600 petroglyphs. Painted Desert Inn: Originally built by the Civilian Conservations Corps, the inn now serves as a museum and national historic landmark. Overnight backpacking is allowed in the wilderness areas but since Petrified Forest National Park does not have campground facilities, most visitors opt for lodging outside of the park walls. Nearby campgrounds include a KOA and RV park in Holbrook, located about 26 miles west. Nearby lodging is also in Holbrook, including the American Best Inn and Holbrook Comfort Inn. Walnut Canyon National Monument: Located in Flagstaff, AZ this area was home to the Sinagua Indians. Cliff dwellings are accessible by trail and this historic monument is about 107 miles west of Petrified Forest. Sunset Crater Volcano National Monument: Also located in Flagstaff, this monument showcases the volcanic eruptions that occurred sometime between 1040 and 1100. Among trails of lava flow and cinders, visitors can see signs of wildlife, trees, and wildflowers. Wupatki National Monument: The Wupatki Pueblo was the largest of its kind less than 800 years ago and served as a meeting place for different cultures. It is located in Flagstaff at the same exit for Sunset Crater Volcano National Monument. Grand Canyon National Park: Part of the Painted Desert, Grand Canyon remains one of the most popular and most iconic national parks. The 18-mile wide gorge is a must-see for all. El Morro National Monument: Two ancestral Puebloan ruins showcase inscriptions of pre-Columbian Indians. It is open year-round and located about 125 miles away from Petrified Forest. El Malpais National Monument & National Conservation Area: The name actually means “the badlands” and showcases lava beds, ice caves, and Puebloan ruins. Activities include camping, hiking, and horseback riding.